The Florida Gators need help at kicker. As much was made obvious Monday when the team’s recruiting-centric Twitter account put out an all-points bulletin calling for current students to sign up for tryouts. Redshirt freshman walk-on Jorge Powell, who had been playing in place of redshirt junior Austin Hardin (hip flexor), suffered an injury of his own Saturday at LSU and missed the remainder of the game. 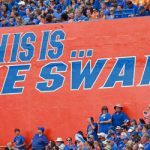 Though Hardin was able to step in and play – he traveled with the team to Baton Rouge, Louisiana – his presence may not be enough for the Gators for the remainder of the season. No status update was available on Powell as Florida did not hold its normal Monday afternoon press conference due to the bye week. 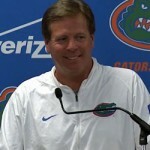 However, head coach Jim McElwain should address the kicker’s status by Wednesday’s SEC teleconference at the latest. Assuming Powell is out for an extended period of time, the only kicker remaining on Florida’s roster would be an ailing Powell. As such, at least one extra body will be needed to get the Gators through the season. Tryout signups ended at 4:30 p.m. Monday but one familiar name will be among those looking to earn a spot on this team this week. Brooks Abbott, who signed with Virginia Tech out of high school before transferring to Florida after his sophomore year, spent 2014 with the Gators but was nowhere to be found on the 2015 roster. According to a school spokesman, Abbott decided to give up football. Abbott makes the most sense as an addition back to Florida football roster. Of course, there are bound to be a number of other students (minimum 12 credit hours needed) giving it a shot. May we suggest junior soccer forward Savannah Jordan? Didn’t see injuries at PK before the season as being one of our possible thin areas. Two kickers injured in the same year? Not normal. Abbott,go for it man! this may be opportunity knocking! GO GATORS! Why is it that every SEC team always has a good kicker except for us? We had one best in Caleb Sturgis but nothing after he left. And we had some good kickers before Sturgis during the Meyer era.